Jackie Robinson broke the color line in baseball, indeed, but will we ever reach that point where can we appreciate him, and others, for something more than social pioneers? As a baseball junkie, and a historian of the game, no one has to preach to me the merits of what Jackie Robinson did on April 15, 1947…when he became the first black ballplayer to play in the major leagues. I wasn’t there, of course, or even around. But there’s plenty of evidence of his trials and tribulations, of his relationship with Branch Rickey and promise of tolerance for the racist threats he’d received for his courage to be the first. Ken Burns has enhanced his legacy by telling the Robinson story, and with artful professionalism, at that. I had an uncle in the early 60s who loved baseball and taught me much of what I appreciate about the “Golden Age” of the game, and he told me a lot about Robinson in comparison to the other top white players of his day. By his logic there really was no difference for the fact of his color; he was just more daring and determined to show that he belonged – that other black ballplayers belonged – and that he never took his status as a major leaguer for granted. A person with any job should treat it that way, he would say. 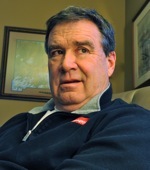 I remember him talking about the weight of Robinson’s bat, a huge, thick-handled Louisville Slugger model that some of the high schools in his area would buy for their players, coaches preaching the attributes of choking up, as Jackie did, making contact, and slapping the ball to all fields. Put the ball in play, they’d say, and the Robinson bat was the essence of a tool with which to do just that. My uncle died in 1978, a few years after Jackie Robinson passed away, still talking about Robinson the ballplayer, never once dwelling on Robinson as being a racial cornerstone for culture, as comes to mind now each April 15th. The major leagues now dictate that every player wear his #42, I guess as reminder of how bad we once were for the sake of what was then called…the national pastime. 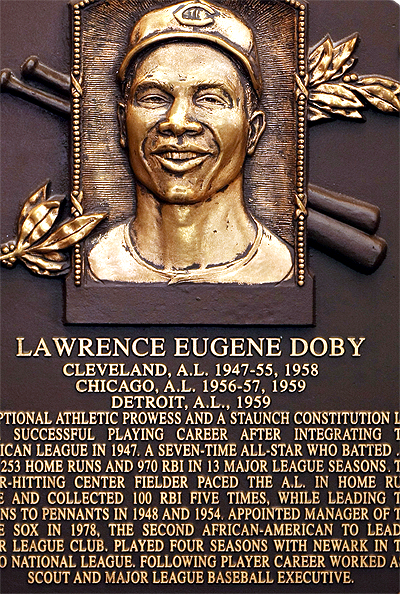 Larry Doby played longer than Robinson, with a career average of .283 and hit 253 home runs. But now as a baseball person I question Jackie Robinson being “politicized” as he is, relevant to the modern issues of our country, as a stimulus for change. If you look at the events surrounding race relations since 1947 a lot of people…I mean a lot of them…haven’t changed all that much. There are still more questions than answers outside of baseball. And it’s pretty obvious that what Robinson did, and for the myriad of black players that have played since, was prove that if you can run, hit, hit for power, field, and throw, there’s a place for you in any walk of life. In terms of essence, what Robinson came to represent…was OPPORTUNITY! The term “politicized” is bound to ruffle some feathers for those looking for an argument, or someone willing to wave the banner for bigotry whenever its convenient. 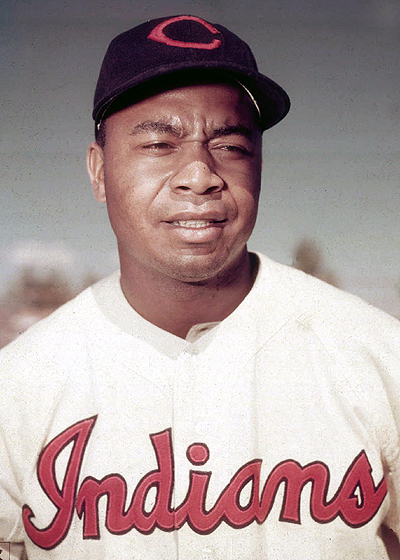 But for the sake of what Robinson did, Larry Doby did the very same thing with the Cleveland Indians, a scant six weeks later in 1947…and hardly a word was heard on April 15 over him being the first black player in the American League. Why? In fact, pity the legacy of Doby because he actually played three years longer than Robinson, had an equally productive career, and a similar impact on the game itself as a player, and later, as manager of the Chicago White Sox. I wonder every year…why so much written, spoken, and publicized about Robinson, and so little about Larry Doby, who endured the exact same hardships, but without the headlines? The reason? Doby was a very quiet man, a wonderful personality, but not one to challenge and speak out in the manner of Robinson in later years. Larry Doby would have made a terrible movie subject because he wasn’t controversial, preferring to be left out of the spotlight, anonymous. I wonder if it isn’t time to change the discussion on Jackie Robinson to include Larry Doby, the first black baseball players in major league baseball? I wonder if it isn’t time to appreciate equality for what it actually is. If you can play, you can play. If you amass the numbers and demonstrate your significance as a ballplayer, you can become a hall of famer. But why Robinson in 1962, and Doby, 36 years later, in 1998? I wonder if it isn’t time to quit saying that Jackie Robinson made us all think better about each other? That’s obviously not true of all, given the events of recent years, in Dallas, in New York City, and other communities. The fact is…that those of us who have come to an appreciation of racial equality never needed a baseball stimulant. A lot of people have always recognized equality for what it is – character, skill, humility, and a passion to succeed. They nodded their head, and moved on. For the sake of what April 15th’s come to mean, I wonder if it isn’t time to move Larry Doby onto Jackie Robinson’s Mt. Rushmore, where they equally deserve to be! And finally, I wonder if isn’t time to quit reminding ourselves that we’re less than we can be…simply because we once were! Isn’t it time to appreciate that there is no divisiveness in the term…play ball!